I just bought a used set of Ping ISI beryllium copper irons. I’ve been looking for a new iron set for a while, as I’m trying to get back into the game after playing very little over the past few years. I did some preliminary demoing and decided the ISI’s were forgiving enough for my higher handicap without being bulky or wide-soled (not sure what it is anymore, but I’m assuming a bogey-round would be a delight for me). I found myself having to decide between the steel and copper ISI’s, the coppers being over $100 more for an 8-piece set. I went with the coppers, presumably because they felt softer when I demoed them at the range. After I walked out the door with the beryllium coppers I immediately wondered why I was willing to pay 34% more for them over the steel sets. Being the way I am—I act first and figure out what it all means later—I decided to look into what this beryllium copper jazz was all about. The beryllium copper iron was introduced by Ping in the early eighties with the release of the 1982 Eye2’s. 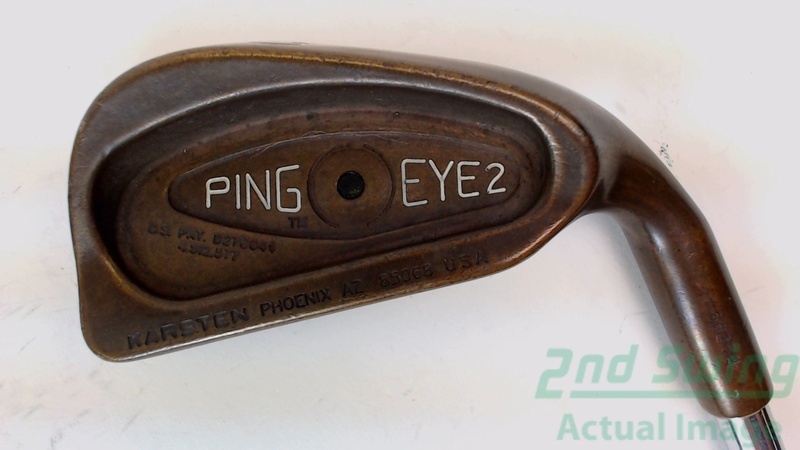 1984, Ping releases the BeCu Eye2, or Beryllium Copper Eye2 iron, which is actually cast using the Eye2 Lite molds. It’s rumored that this was actually due to the fact that Solheim had green-lit the production of a ‘feather lite’ Eye2 model in order to compete with the then popular Dave Pelz-designed Feather Light irons; by the time the irons were ready for selling the golf world had abandoned the fad, so Solheim decided to use the same expensive tooling he’d invested in for producing the ‘feather lite’ irons to make a new model, rather than waste the investment. So was born the Beryllium Copper Eye2 irons, which filled the same mold as the Lites, but was much heavier due to BeCu’s higher density over stainless steel. Soon followed the BeCu Zing irons in 1992, then finally the last incarnation of the Ping BeCu irons, the Beryllium Copper ISI irons in 1998, two years after the stainless steel model was first introduced. Why did they stop making the beryllium copper irons? They stopped production of the BeCu irons after the 1998 ISI’s, why? The rumors that circulate take on a mythic dimension. Some say the irons were merely too costly to keep producing. Most say the material used was hazardous to work with so Ping and other manufacturers stopped making them. After some research I’ve made two conclusions: 1) Beryllium compounds are toxic in dust or vapor form, which can cause serious lung damage under continued exposure. 2) The EPA classifies beryllium powder as a hazardous waste material under CFR Section 261.33. Basically, beryllium powder, which ‘dust’ and ‘vapor’ are considered, poses a natural health risk for workers, though in solid form or finished products the compound has no known health risks. I can’t qualify or disqualify claims that Ping and other manufacturers discontinued production of beryllium copper clubs due to legal or legislative pressures regarding health concerns, but I can surmise that that is a logical rational. Equally logical is the possibility that Ping and other manufacturers stopped producing them without legal pressure and simply thought the health risks were too great to justify continued production. How good are they, really? What does all this BeCu talk really mean regarding golf clubs? Initially I set out to find out why Beryllium Copper Ping ISI irons are about 34% more expensive. After going through many forums and articles, I immediately realized that the copper irons have a ‘fetish’-type quality to them because they’re no longer produced, which could explain the higher market value. However, I suppose then, a follow-up question of mine would be: Are BeCu irons more expensive simply because they’re not made anymore? Or do they have a utility quality that makes them play better? One camp agrees that BeCu irons actually feel softer, about as soft as a cast iron can get; this camp also believes the Eye2’s, Zing’s and ISI’s are superior clubs because of their design combined with the copper casting material. The other camp believes that the copper only adds ‘fetish’ value to the item, meaning there is no utility to the copper and that it plays the same as any other cast club. Personally, after hitting them and playing them, I can feel confident that I didn’t just pay for ‘snob’ appeal. I demoed the stainless steel, the nickel and the beryllium copper ISI irons back-to-back-to-back and found that the copper was definitely softer feeling. It was not a night-and-day difference however, from the stainless steel or especially the nickel—it was only a slight difference. Additionally, I found the copper ISI’s to be no more forgiving than the other two materials, though off-strikes certainly FELT less severe. Overall, I’d have to say that the performance of the BeCu ISI has little footing in the inflated price tag. FEEL, however, is also very important to many players and, that said, the improved feel warrants definite notice, so I can see some price inflation justifiable in that area. All in all though, I believe the majority of the pricing difference is due to Rarity—from what I’ve been able to dig up, no one produces BeCu full iron sets anymore. Please share your thoughts and insights on the Beryllium Copper ISI irons, or any other BeCu irons that peak your interest. I could be wrong about some things and welcome the input! I didn’t realize they didn’t make them anymore; enjoying my Dunlop set for over a quarter century. Wouldn’t trade them; just feel very very comfortable.